Judith Eisler’s paintings begin with photographs she takes of movies. 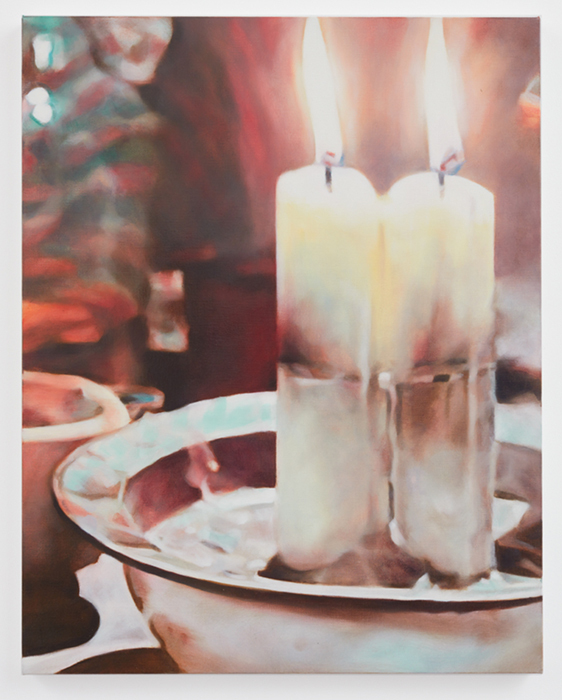 About her process, she says, “Working with the pause button and a camera, I look for a precise instant that embodies an action, an emotion, and a psychological tension.” Eisler’s final work is often cropped and imbued with a strange, distorted light resulting from the screen and the camera she uses to take the photo, seen here in Candles 2. Her works embody the seductive, mysterious quality of the heightened, manufactured reality of the world of cinema. Eisler has been included in exhibitions at the Hayward Gallery, London; Castello di Rivoli, Turin; Bass Museum of Art, Miami Beach; and Yale University Art Gallery, New Haven, among others.